Two days ago I told you that I am sort of obsessed with harissa so today: a recipe with harissa. I make harissa -> I have harissa in my fridge -> I cook with harissa. It’s like saying that two comes after one, three comes after two, four comes after three, five comes after four, etc. Of course there are those recipes that I plan and tinker with until they hit on some idea I have in mind. I had chicken and harissa in the fridge so I made Sticky Harissa Chicken. I couldn’t believe how easy and good this was. 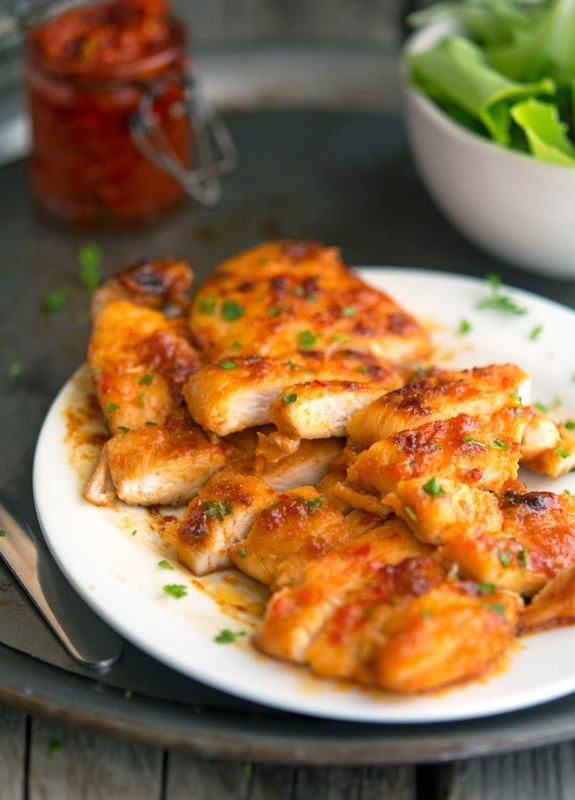 The chicken is treated with a marinade that is boldly accented with harissa, there’s the sweetness and stickiness of honey, with hints of lemon, and musky sweet paprika add its fragrance and complexity to this legit chicken. This is a great recipe if you like a little kick to your chicken. It's sticky and sweet, ever-so-juicy, tender, and everything it should be. 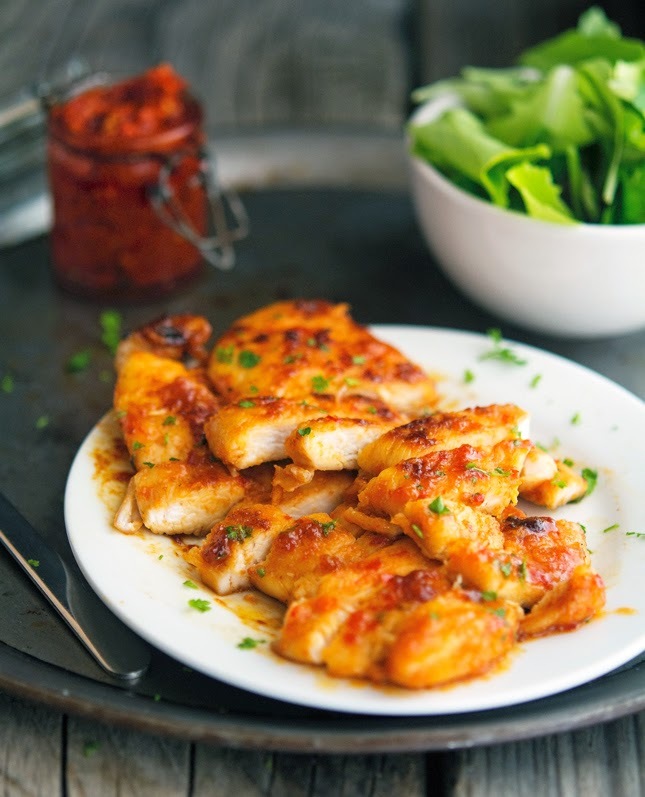 Sticky Harissa Chicken Print this recipe! In a small bowl mix harissa, honey, olive oil, sweet paprika, lemon juice, lemon zest, salt and pepper. Put the chicken in a shallow bowl (or Ziploc bag), add marinade, cover (or seal) and marinate for at least 10 minutes. Heat an ovenproof skillet over medium-high heat, add the chicken and fry for 3 minutes on each side until golden. Transfer to the oven and cook for about 8 to 10 minutes until cooked through and sticky. 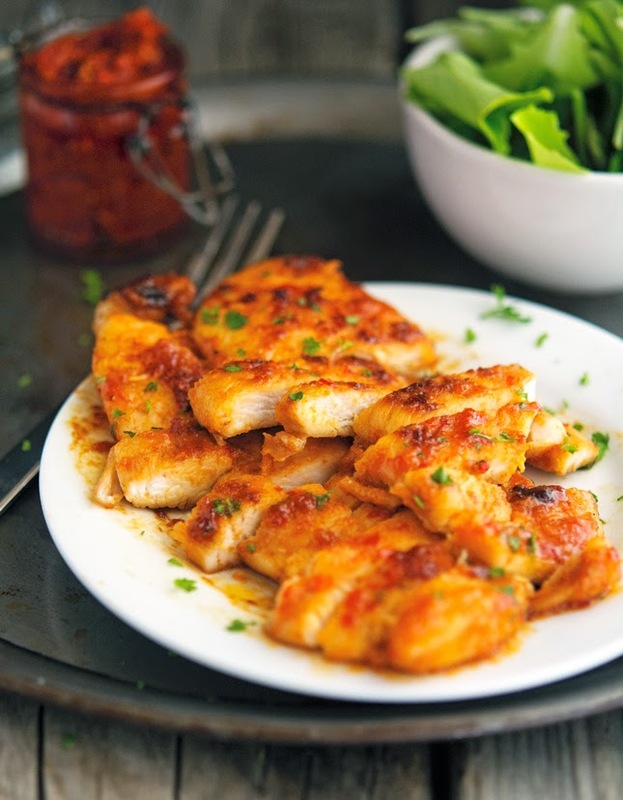 Slice the chicken, sprinkle with chopped mint and serve, along with any pan juices. One serving yields 244 calories, 11 grams of fat, 9 grams of carbs, and 26 grams of protein. I'm always looking for recipes to spice up chicken. This looks delicious! If you try it, please reporto back! This looks fantastic! The spice, the honey, the mint all mixed with a citrus zest spells YUM to me. Have a great weekend. Thanks man, I hope you had a great weekend yourself! Easy is good, especially for us. Love this Mike! Hand me a fork, I want to dive into this chicken! Sticky chicken sounds poetic to me :). Things don't have to be complicated to be good... reminds me of that great saying by Leonardo da Vinci -- simplicity is the ultimate sophistication. Sounds fantastic, although it could be great for a dating site too, keep that in mind, just in case. Now, is it redolent of harissa? maybe I am not using it right - redolent with harissa? redolent from harissa? Hi Mike, this looks really good! Pinned! Hi Mike, wow... your chicken harrisa look so inviting and awesome. Fantastic, 2 thumbs up for you. And excellent photography skill. Thanks for sharing your recipe. All of your dishes always look so good. My husband is a fan of hot and spicy and I'm sure he would really enjoy this recipe. If he likes hot and spicy then this DISH is DEFINITELY for your hubby! This looks so good! I have been meaning to make homemade harissa and this will be my impetus. There's nothing quite like making homemade harissa...OK, I might be exaggerating a bit but it's definitely worth doing it! Haha! I clicked on your link and was afraid I had been misdirected TO one of those dating sites!!! I love a kick to almost ALL my foods so this chicken sounds wonderful to me! Dating sites are fun. Don't you agree? That's so the way we roll D, Wolfpack's style! I'm such a fan of harissa! This looks awesome dude! Pinning! I tried this recipe tonight but added some pomegranate molasses along with the honey. :) Really delicious. Thanks for posting. I liked the idea of frying first and then baking - the chicken came out very soft yet well cooked through. Served with some couscous and dried fruit - delicious. Thanks for the recipe! Damn. I need this in my life, stat! Will be making this week for lunches, for sure. Thanks for an amazing recipe. 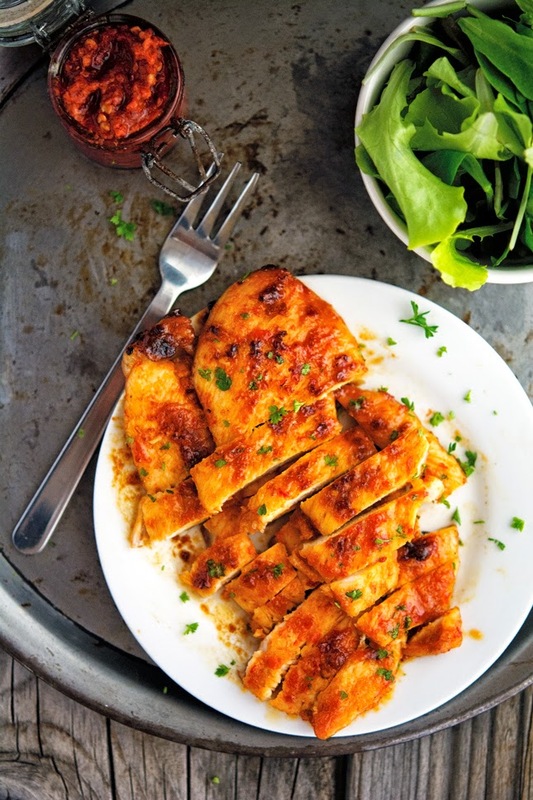 How big are the chicken breasts you use for this recipe? Standard 4oz or bigger? This was delicious, but frying it didn't do so well. The marinate burned on the pan. Plus, I had to cook it longer than the recipe said to because it was still raw. Next time, I think I'll just cook it in the oven and skip the pan. Wow this looks so delicious. I can't wait to make this at home - the family is going to love it! I love that it has harissa in it too - definitely one of my new favorite ingredients to use in most of the dishes I make at home recently!